From my regular journey home with a star 2 filter. This will surely bomb - for all I care. No offence whatsoever! Thanks for commenting. I agree this second one would likely have scored higher; it has a little more 'razzle-dazzle'. However, I still prefer the actual entry. For me it better communicates the fleeting, impermanent nature of the commuter's relationship with his environment. He's right there, passing through it, but he's not really OF it ... he's in a 'non-place'. Presumably, the title suggests you were exploring that sort of idea? What I specifically prefer about the entered image is, as I said in my comments during voting, the fact that the commuter's attention appears directed at the reflected destination/location (?) sign. 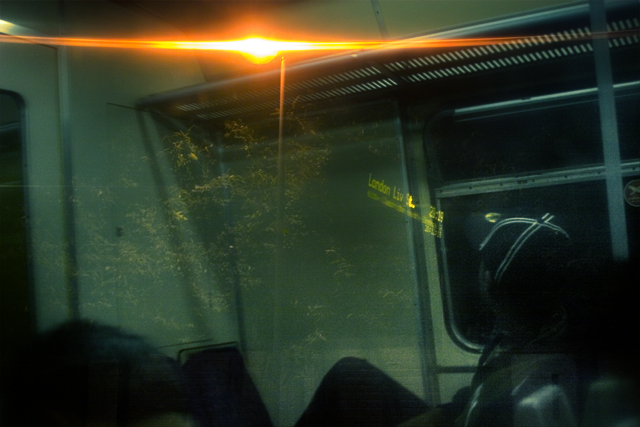 Coupled with the alien-looking light source, this reflected illusion creates a surreal impression that, for the commuter, the journey could as well be intergalactic as intersuburban. On the other hand, maybe I've just been looking at the damned thing for too long? Either way, it's entertaining and stimulates thought. God, I'm even worse than that ... I gave this an 8 and later felt guilty that it should probably have been higher. Fortunately, I doubt that Jon cares too much and so will not be at all offended. A clever image. The person's gaze directed toward the reflected sign and the alien-looking light source creates a slightly unworldly, surrealist effect which is further heightened by the bizarre "X" cap he/she is wearing. I like it because it's original and because it challenges the viewer to participate rather than just spectate. Alas, the spectators will vote it down! 8. It took me a while to work out what this is. It looks a bit 'snapshotty' and there's a lot of noise in the photo. It's a nice effect. Just not a really captivating picture, maybe some cropping would help. I find this tremendously appealing...hypnotic even...well done. Interesting. Doesn;t quite work for me but I like the idea. My eye is uncomfortably cutting back and forth between the tree and the light. Okay bus, commute, travel... not sure what your subject is. I find the flash reflection distracting. The person would add interest, but blends in too much with the window. I think this would have worked better if the reflection of the trees on the glass had been stronger. Proudly hosted by Sargasso Networks. Current Server Time: 04/26/2019 02:14:40 AM EDT.